So you are interested in aerial and circus arts but you don’t know where to start. Night Flight offers both adult (ages 16+) Series and Drop-in classes. Series classes include trapeze, silks, lyra, sling, straps, stretching, contortion, handstands and more. Our teachers are dedicated to offering fun and challenging classes with personalized attention. Aerial and circus training develops strength, control, flexibility and fluidity of movement, and it is a great way to get in shape. Although our primary focus is Series classes, since we believe that this is the very best learning environment for our students, we do offer weekend Drop-in classes. If you are on the fence about aerial classes, we recommend trying one of our Saturday and Sunday Drop-ins before committing to a Series. This is a great way to get a taste of aerial and check out our studio. Please note: We don’t allow Drop-ins in our Series classes. Our Drop-in classes focus primarily on silks and trapeze. Learning aerial is challenging and we are more than happy to work at each student’s level. We don’t expect any of our new students to be crazy ex-gymnasts. All it takes is an willingness to learn! We are excited to share our love of aerial and our wonderful Night Flight community with you! Night Flight offers adult (ages 16 and up) Aerial Drop-in classes in aerial arts in Portland, OR. Our Drop-in classes are a great way for students to try out aerial before committing to a Series class. Now you can sign-up and pay for a Drop-in classes online. For more information please visit our Drop-in Classes page. Our Series classes cover a specific set curriculum and range from beginning classes to advanced. New students interested in our Aerial Series classes who have no previous aerial training are required to start with either Absolute Beginning Aerial or Beginning Aerial 1. Our 4-week Absolute Beginning Aerial Series is designed for complete beginners and moves a little slower than our 7-week Beginning Aerial 1 Series. It is designed for people who are newer to movement classes and who might feel intimidated by joining an aerial class. If you are already active and experienced with movement classes, we recommend our 7-week beginning Aerial 1 Series. In our 4-week Absolute Beginning Aerial Series less time is spent learning beginner silks and trapeze poses and tricks than in our 7-week Beginning Aerial 1 Series. Emphasis is instead placed on floor conditioning and foundational exercises on aerial equipment. This Series is a great place to get in shape in preparation for Beginning Aerial 1 if it is needed. Unlike other studios, our both our Absolute Beginning Aerial Series and our Beginning Aerial Series have classes that are 1.5 hours long! We believe that letting students take their time to learn and not rushing through technique explanations is the key to students progressing. 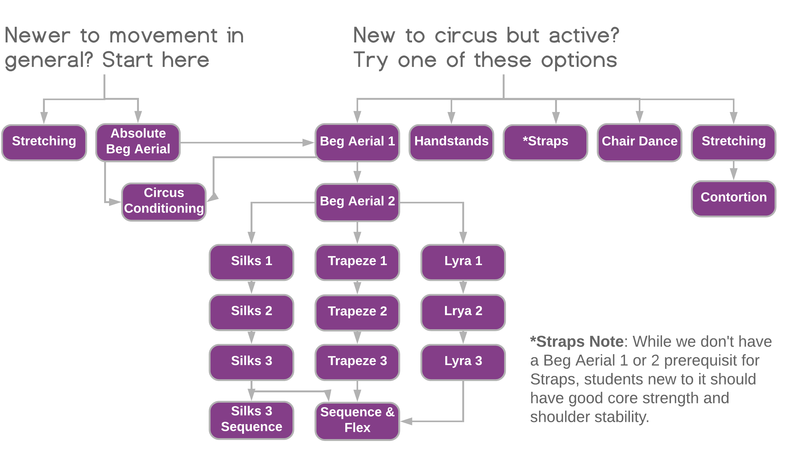 So each class incorporates a proper warm up, conditioning, pre-hab exercises, and the fundamentals of silks & trapeze. Night Flight also offers Series classes in stretching, contortion, handstands and more. Class size is limited, so register early. For more information please visit our Series Classes page. Students are not allowed into class more than 15 minutes after class starts. The warm-up is part of the class and for safety reasons, we can’t allow students on the equipment without a proper warm up. Arrive early so we can get the paper work out of the way. Wear form-fitting clothes. We suggest a pair of tights/leggings and form fitting shorts or fitted yoga pants that aren’t too loose around the ankle and a form fitting tank, workout top, or leotard. Clothes that are too baggy can get caught on the equipment and may drive you crazy. NO ZIPPERS or jewelry on the equipment. We suggest leaving all your jewelry at home where it’s safe. Bring water or a water bottle to class. You will be so much happier if you do.